Former CIA director Gen. Michael Hayden delivers remarks on national security at the National Academy of Sciences in October. Hayden is among a growing number of former intelligence officials who are now speaking out regularly in retirement. 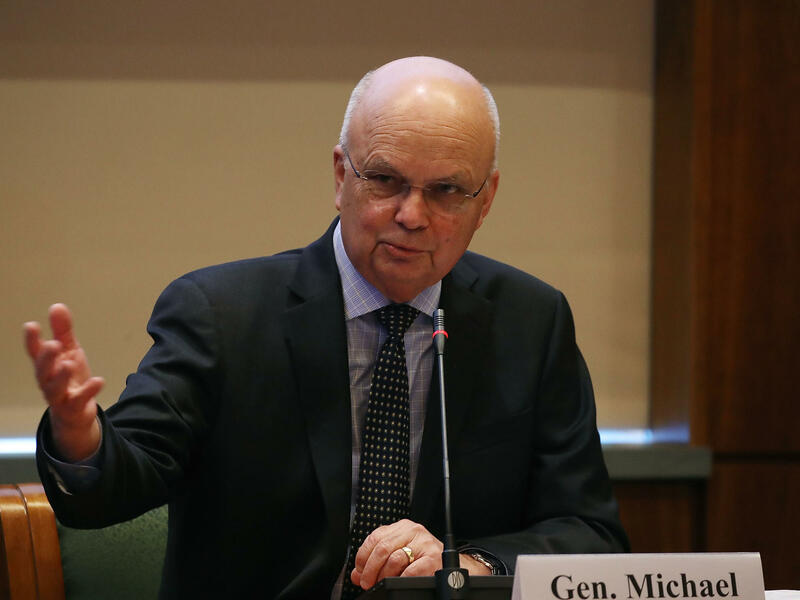 When Michael Hayden ran the CIA and the National Security Agency, his public comments were largely confined to congressional testimony. Now that he's retired, "I'm on Twitter and I'm on CNN," said Hayden. He was also the featured guest as dozens of former national security officials and several current ones spoke at a recent conference on threats the U.S. faces. A few journalists were also invited to the resort on Sea Island, Ga., where almost everything was on the record. Hayden and his former colleagues were OK with that. Spies used to retire and fade away as quietly as when they were on duty. Now they go on cable TV. They write op-eds. They take to Twitter and criticize the president. "Used to be when you retired from the Clandestine Service in the CIA, you had to stay under your previous cover," said John Sipher, who has the perfect name for a spy. And that's exactly what he was for nearly 30 years at the CIA. "In recent years, retirees like myself have been able to, what we call 'roll back cover,' and be able to talk about some of the things we did," Sipher added. The conference was organized by The Cipher Brief, an online publication that features analysis from former spies like Frank Archibald, who addressed terrorism threats and rebuilding fractured Muslim countries during a panel discussion. "You have to give people security, you have to give them justice and you have to give them some sense of an economy, that my children will do better than I will," said Archibald, sounding more like an aid worker than head of the CIA's Clandestine Service, which was his final job before he retired from the agency in 2015. "That's how the movie ends. Better governance and a better understanding of the soul of Islam," Archibald added. "Otherwise, we'll be campaigning [militarily] until our grandchildren grow gray." Suzanne Kelly, a former reporter, created The Cipher Brief three years ago. "What we're really trying to do, and I think what we've done, is change the culture of agencies, of people who have been told their entire career, 'Don't talk to the media. The media are bad,' " she said. The former spies are still hesitant to address some sensitive topics, like the CIA's waterboarding campaign in the years immediately after the al-Qaida attacks of Sept. 11, 2001. They can conveniently — and accurately — claim that details of these matters remain classified, and therefore are off-limits for discussion. But they are willing to discuss quite a bit, at least in broad terms. For Hayden, a key moment was the 2013 disclosures by NSA contractor Edward Snowden, revealing the extent of the agency's eavesdropping program, creating a firestorm of criticism about NSA practices. Hayden, who ran the NSA from 1999 to 2005, said the agency had worked with the White House, Congress and the courts in developing the programs. But it didn't share anything with the public until it was forced to do so by the scandal. In his view, that was a big mistake. "Hence you see an awful lot of folks like me, within the bounds of classification, trying to describe to the broader public what it is we do, and why, so as to get their understanding and, if not their enthusiastic approval, at least their acceptance," Hayden said at the Cipher Brief conference. President Trump has raised doubts about the intelligence agencies and their findings regarding Russia's meddling in the 2016 election. As some retirees fire back, it raises questions about their long tradition of neutrality. John Brennan, an ex-CIA chief, has tweeted just 25 times. Yet he's amassed more than 220,000 followers by lambasting the president in comments like this one below, unleashed last month, when FBI official Andrew McCabe was fired. Sipher began speaking out last year, after the Russia dossier on Trump, compiled by former British spy Christopher Steele, became public. "Since I served in Russia, was aware of Mr. Steele, and know how the Russian intelligence services worked, a number of people reached out to ask questions," Sipher said. A CIA spokesman stresses that no employee — active or retired — can divulge classified information. And anything they write must be approved in advance by the agency's Publication Review Board. But Sipher and others have found themselves in new territory. "How do you talk to reporters? How do you go on television? And the answer was a joking, 'They don't really have a process. We assume that you sort of understand where the line is,' " he said. You can expect to hear more from the former spies. Several former CIA chiefs appear on television these days. And one of them — Michael Hayden — has a new book coming out this week. There was a time when spies would retire and fade away, staying as quiet as they were when they were on duty. Now they go on cable TV. They write op-eds. They're on Twitter, criticizing the president quite often, and they also speak with NPR's Greg Myre. MICHAEL HAYDEN: I'm on Twitter. All right? And I'm on CNN. MYRE: And he was the featured guest as dozens of former national security officials and several current ones spoke at a recent conference on threats facing the U.S. A handful of journalists were also invited to the event on Sea Island, Ga., and Hayden and his colleagues were OK with that. JOHN SIPHER: Used to be when you retired from the Clandestine Service in the CIA, you had to stay under your previous cover. MYRE: That's John Sipher. He has the perfect name for a spy, and that's exactly what he was for nearly 30 years at the CIA. SIPHER: In recent years, retirees like myself have been able to what we call roll back cover and be able to talk about some of the things we did. MYRE: The conference was organized by The Cipher Brief, which isn't named after John Sipher, though he writes for the online publication. It features analyses from former spies like Frank Archibald, speaking in this panel discussion about rebuilding fractured Muslim countries. FRANK ARCHIBALD: You have to give people security, you have to give them justice. And you have to give them some sense of an economy that my children will do better than I will. MYRE: Archibald sounds more like an aid worker than head of the CIA's Clandestine Service, his final job before retirement in 2015. Suzanne Kelly, a former reporter, created The Cipher Brief three years ago. SUZANNE KELLY: What we're really trying to do, and I think what we've done, is change the culture of agencies that have been told their entire - you know, people who have been told their entire careers, don't talk to the media, the media are bad. MYRE: Michael Hayden's view began to change in 2013 when NSA contractor Edward Snowden revealed the extent of eavesdropping programs that remain controversial. Hayden says the Agency worked with the White House, Congress and the courts, but it didn't communicate with the public until it was forced to. He says that was a mistake. HAYDEN: And hence, you see an awful lot of folks like me within the bounds of classification trying to describe to the broader public what it is we do and why so as to get their understanding and, if not their enthusiastic approval, at least their acceptance. MYRE: President Trump has questioned the intelligence agencies and their findings regarding Russia's meddling in the 2016 election. As some retirees fire back, it raises questions about their long tradition of neutrality. Ex-CIA chief John Brennan has tweeted just over 20 times yet he's amassed more than 200,000 followers by lambasting the president. Here's a voiceover of a recent one. UNIDENTIFIED PERSON: (Reading tweet) When the full extent of your venality, moral turpitude and political corruption becomes known, you will take your rightful place as a disgraced demagogue in the dustbin of history. MYRE: John Sipher began speaking out last year after the Russia dossier compiled by former British spy Christopher Steele became public. SIPHER: Since I had served in Russia and I was aware of Mr. Steele and aware of how the Russian intelligence services worked, a number of people reached out to ask questions. MYRE: A CIA spokesman stresses that no employee, active or retired, can divulge classified information. And anything they write must be approved in advance by the Agency. But in a changing media landscape, it's complicated. SIPHER: How do you go on television? And the answer was sort of a joking, like, they don't really have a process. We assume that you sort of understand where the line is. MYRE: That line is moving, but there's still a lot that goes unsaid. Greg Myre, NPR News, Sea Island, Ga. Transcript provided by NPR, Copyright NPR.